Join our Mailing List for regular updates on our events. You can find us on Google Maps or on the simple map below. The DBC is serviced by many transport options. Please consider cycling or using public transport whenever possible as a sustainable way to travel! Cycling: If you’re cycling to the centre, there are many places to lock your bike on Talbot Street. There are also posts you can lock your bike to on James Joyce Street, but, unfortunately, bikes have been stolen from here in the past. If you lock your bike well it shouldn’t be a problem. Dublin Bikes: There are also three Dublin Bikes stands near the centre, the closest one being on Talbot Street. These stops are marked on the second map above – they are #38 Talbot Street, #23 Customs House and #45 Deverell Place. Dublin Bus: There are a large number of buses that serve the immediate area and O’Connell Street is a 10 minute walk away. Please check on the Dublin Bus website for more info. On-street parking is available on James Joyce Street and there are usually spaces available in the evenings. This is free of charge after 7pm. Cars are usually safe on street, but as always when parking anywhere in the city-centre, we’d advise you not to leave any valuables visible in your car, as this will encourage theft. There are a couple of car-parks near the centre. 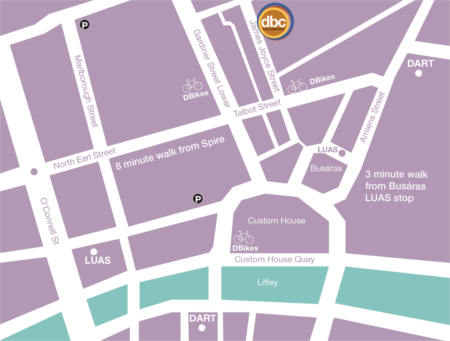 The nearest is the Irish Life Car Park, which is accessibly from Lower Abbey Street. Another close one is Q-Park on Marlboro Street (listed under ‘Q-Park Clerys’ in Dublin). This is roughly 5 minutes walk from the centre. Please fill out the form if you’d like more information about our courses or the DBC. Note that your contact details will not be used for any purpose other than to reply to your email, in line with our DBC General Data Protection Regulations (GDPR) Policy (PDF). For regular updates of all our events, you can sign up for our mailing list. Note that your contact details will not be used for any purpose other than to reply to your email, in line with our General Data Protection Regulations (GDPR) policy (PDF). Join our mailing list for regular updates on our courses for newcomers. This email is is never more than once a month and you can easily unsubscribe from it at any time. Note that your contact details will not be used for any purpose other than adding you to our mailing list, in line with our General Data Protection Regulations (GDPR) policy (PDF). The DBC is serviced by many transport options. Please consider using public transport whenever possible as a sustainable way to travel! If you’re cycling to the centre, there are many places to lock your bike on Talbot Street. There are also posts you can lock your bike to on James Joyce Street, but, unfortunately, bikes have been stolen from here in the past. If you lock your bike well it shouldn’t be a problem. There are also three Dublin Bikes stands near the centre, the closest one being on Talbot Street. These stops are marked on the second map above – they are #38 Talbot Street, #23 Customs House and #45 Deverell Place. There are a large number of buses that serve the immediate area and O’Connell Street is a 10 minute walk away. Please check on the Dublin Bus website for more info.